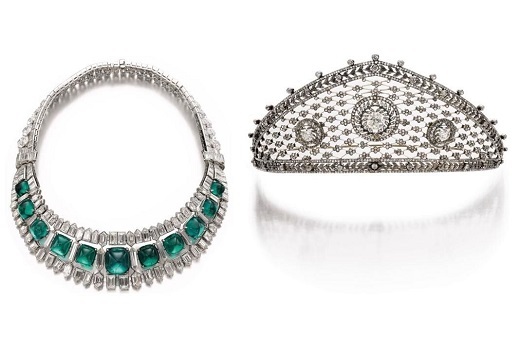 RAPAPORT... Sotheby’s will offer two rare jewels with royal connections at its auction in Geneva next month. An Art Deco necklace will feature in the Magnificent Jewels and Noble Jewels sale May 14. The Van Cleef & Arpels piece includes diamonds, as well as 11 cabochon Colombian emeralds with a total weight of more than 75 carats. It was created in the 1930s for Hélène Beaumont, an American socialite and close friend of Wallis Simpson, the duchess of Windsor. The piece has a presale estimate of $3 million to $4 million. A diamond tiara, made by Fabergé in 1903 for Duchess Cecilie von Mecklenburg Schwerin, the last crown princess of Prussia, will also go under the hammer. The headpiece, which was a present from her Russian relatives upon her marriage to Crown Prince Wilhelm, is valued at $200,000 to $300,000. Other notable pieces include a brilliant-cut, 36.57-carat, D-color, type IIa diamond, estimated at $4.8 million to $5.8 million, and an emerald-cut, 18.86-carat, D-color, type IIa ring by Harry Winston, expected to fetch $800,000 to $1.2 million.